Eleven renowned French artists and 40 of their Chinese colleagues gathered at the China-France Superior Forum for the Protection of World Cultural Diversity, held in Guilin, South China's Guangxi Zhuang autonomous region. While most participants held dialogues on cultural diversity, Chinese guqin (seven-stringed zither) player Wu Zhao joined the discussion in a unique way. He demonstrated the ancient Chinese instrument's charm through the performance of a piece titled Song of Mountain Living (Shanju Yin). "Through this piece, we can see the difference between Chinese and Western music. In Chinese music, there are many notes with flexible pitches. At the same time, serenity is very important in guqin music, since we play guqin not for entertainment, but for self-cultivation," he said. Wu's performance and explanation intrigued the participating artists and aroused further discussion. For French composer Francois-Bernard Mache, guqin music represents another dimension of music. "Guqin music is very meditative and refined. Different from Western music which mostly deals with scales, guqin music focuses very much on the details, such as timber and small vibrations," he said. 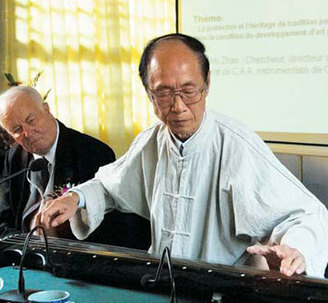 Though Mache said that he would not borrow directly from guqin in his composition, he believes that guqin music can become part of the basis of his own inventions. "The 20th century was a century of adventures in composition, for various music cultures were found and studied by composers," he said. "That period is almost over, and it is now a period of reflection. You can find what appeals to you, but you should also know why you like it." Guests at the bilateral forum came from various fields, including music, fine arts, architecture, and literature. The French visitors were members of the Academie des Beaux-Arts de l'Institut de France, which co-organized the forum with their Chinese partner, the Chinese National Academy of Arts. Some participants were worried about the dilution of cultural diversity. For example, many languages in the world are declining or dying. "Each language is a music system. Even if you don't consider the meaning, there is music sensitivity in phonetics," said Mache, who often uses dying languages in his works. Chao Ge, a professor of oil painting at the Central Academy of Fine Arts, agreed. An ethnic Mongolian, Chao is worried about the fact that many young ethnic Mongolian people do not speak the Mongolian language. "Language is the basis of a people's way of thinking and emotions. Without his or her language, a person loses everything," he said. "The decline of minority languages is a problem that we need to pay much attention to, to protect our cultural diversity." For most participants, the time provided by the forum was not enough and they agreed that it was just a starting point for future exchanges. "Our cultures should learn to understand one another and respect their differences, and I hope such learning will enrich our arts," said Arnaud d'Hauterives, permanent secretary of the Academie des Beaux-Arts de l'Institut de France. The Academie des Beaux-Arts de l'Institut de France received its official title in 1803. It is now one of the five bodies making up the Institute of France, the others being the French Academy and the Academies of Science, Literature, and Moral and Political Science. With a history of 57 years, the Chinese National Academy of Arts is the only national-level research institute for art in China.